That's what our dining room was missing! Owls. J and I tend to spend a lot of time on the weekends getting seriously excited about all the major progress we're going to make on our house, and then we spend an equal amount of time reading the paper and drinking coffee, because, hey, it's the weekend, and then we spend a few hours talking about how we're not really getting that much done, and wondering when we'll buy the furniture we need, or finally hang up all our clothes in the bedroom closet, and before you know it, it's the end of the day and we're lucky if we've run the dishwasher. This is just how it goes and as time goes on I'm coming to grips with the fact that progress on the house will take time, and I'm ok with that. So it was a nice change of pace a few days ago when J was running around shouting happily about how, "It's going up on the wall for the first time EVER!" 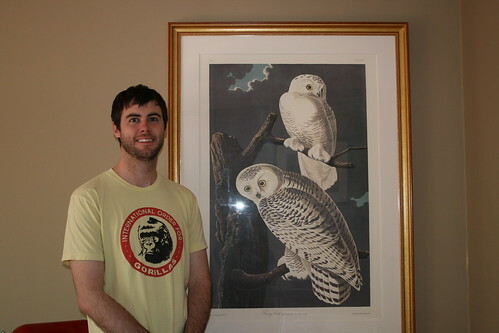 He had decided to hang a major piece of artwork we've had sitting in storage for a few years now - a huge Audubon print of two snowy owls that my father had given him, because my father has no problem furthering his bird obsession, which is probably because my father doesn't have to live with the bird obsession. The owl picture is nice, if a little intimidating. It's not like I have anything against it, it's just that it's so big. But J had suggested it would fit perfectly on our dining room wall, and he had a point. It looks good there, and even though we don't have a table and chairs yet, I think it's safe to the room is gaining in character.